In the fall of 1598, Abraham, a young Jewish jewel trader, leaves behind the comforts and familiarity of Venice to live half a world away in the lush Burmese kingdom of Pegu. Far from the safety of kin and community, as well as the memory of his long-dead wife, Abraham must overcome his fear of these strangers with the odd customs and superstitious ways. Abraham slowly discovers a new world overpowering in its sensuality and freedom. Taking residence in a house previously occupied by another Italian trader, he soon learns a shocking truth: the Italian indulged in a native sexual ritual involving young brides – a duty Abraham, too, is expected to fulfill if he wants his family’s business to succeed. Though it means going against his moral beliefs, Abraham succumbs. To his surprise, instead of the guilt and suffering he expects, acquiescence offers something far more profound: love. Yet Abraham’s newfound joy is soon overshadowed by political turmoil that threatens the entire Peguan empire. Surrounded by danger, torn between the demands of his God and the yearnings of his heart, he must make a fateful choice that will change his life forever and affect all he holds dear. 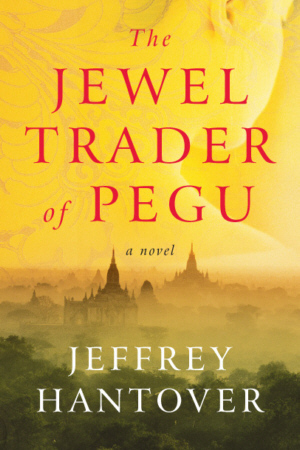 Dreamy and lyrical, steeped in the customs and atmosphere of a world long lost, The Jewel Trader of Pegu takes the reader on a deep emotional journey through the meanings of what is precious. The Jewel Trader Of Pegu is a fine thinking reader’s tale with all the trappings of an exotic historical romance.